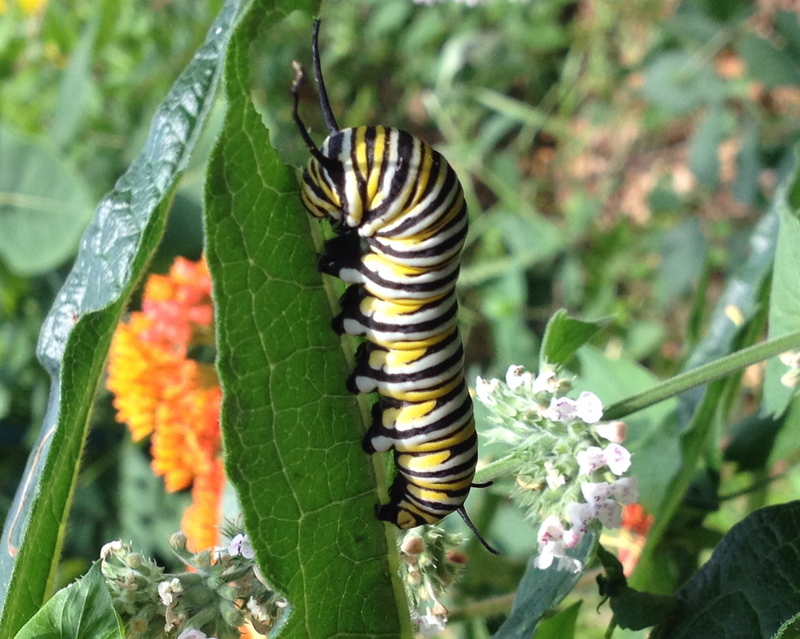 The past few days I have been noticing the Monarch butterfly flying around and the caterpillars eating the milkweed plant. Every year I am fascinated with the life cycle of this butterfly. 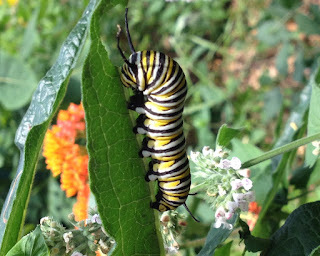 They fly around, lay some eggs, the eggs hatch into caterpillars, the caterpillars spin a cocoon or chrysalis and then a new butterfly is born. I wrote about this before so I won't do that again. Watching this 30 day life cycle that happens every year, made me think of the human life cycle. If we are fortunate enough to experience the whole process, there is an interesting thing about getting old. Rather than live in the present or the future, the mind tends to recall things from the past. I noticed this with my parents and now with myself. It seems we have no control over where our mind wanders to. Sometimes I can't remember the name of the person who does the local news (which I watch almost every day), but something from fifth grade pops into my head. Today, I was trying to think of the name of an actress in a commercial I was watching, when suddenly I remembered doing a report on Aluminum when I was ten years old. From that thought I remembered once a week we listened to a radio program called "Let's Sing". Through the Wisconsin School of the Air on WHA, we had an introduction to music. I guess we didn't have a music teacher. We would get sheets of music printed out on a mimeograph machine. I can still remember the smell of the ink. Out of the blue, I started singing this song. I wonder how many from my fifth grade class remembers this radio show and this song. I love the day of Purim so! Of Esther brave and Haman bold. For every, for every Jewish girl and boy. Maybe this song was an attempt to introduce us to other cultures. This was well before the politically correct curriculum became the norm, so perhaps not. These unexplained thoughts also come forth in nighttime dreaming although the night dreams usually are a combination of many life stories and thoughts. Most of them make no sense at all. Dreaming really confuses me. Last night I dreamt that someone from my past was having a heart attack but when I went to do CPR, he had someone else's face. I suddenly woke up and my husband was talking in his sleep and making guttural sounds just like the dying person. I went back to sleep and had another ridiculous dream that stressed me out. It put me in a bad mood for hours. I won't try to figure out why my mind jumps around the way it does. I think it is because it can. When you are young and either raising children or working in a job to make a living, you don't have room or time for your brain to jump from thought to thought. Now it's actually kind of nice at times. As long as the mind is active, you aren't dead. In fact, I have a theory. I believe this is another stage of life. First you live in the moment and try to survive, then you move to a stage when you try to make the most out of life, third you think of times gone by and and relax about the little irritants but still get annoyed, pretty soon you realize you aren't going to change people and they have to learn their own lessons, lastly comes pure calm, contentment and acceptance. It is all good. Hopefully I have a ways to go since I am in the times gone by stage. When you notice I am in the calm, content and acceptance stage, I will be in the final phase. Until then "Let's Sing". Disclaimer: These are only my personal ideas and feelings. They are not based on any scientific research or fact. I'm sure everyone makes their own journey and some people can be jerks up until their dying day and others have always been cool, calm and collected.